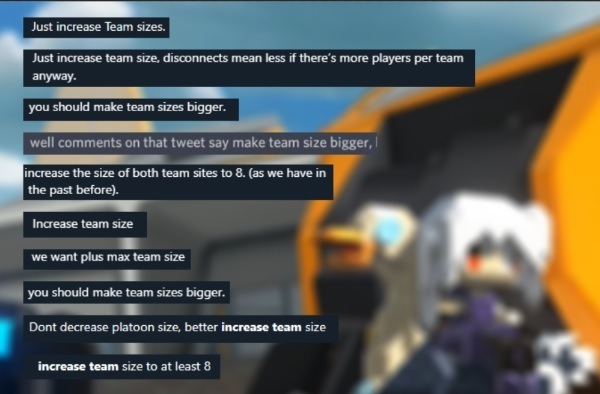 Last week we ran a poll regarding reducing the max party size in response to players being concerned with 5 man teams being pitted against smaller team sizes. There were several plans we had in mind but ultimately we had an overwhelming feedback to keep max party size to 5. So we’re going to run a short experiment Over the easter weekend between the 18th and 22nd of April. All game modes will have their team size increased from 5 to 8! Starting from the 18th of April, all game modes in Robocraft will be 8 v 8 until the 22nd of April. Of course, we’re going to be keeping a very close eye on feedback from players during this period. And will decide whether or not we should make the increase to team size permanent. Let us know what you think of this experiment and we'll see you on the battlefield on the 18th of April 2019! cool... may make me break down an install steam for a while. So what if matchmaking is longer, I want actual matches. If this succeeds will you guys try readding old maps modded to fit the new BA? hope they scale-up the maps too, as 8v8 on these current maps would feel crowded. Looser matchmaking? Engage rose colored glasses. I didn't realize MM had room to become looser, I mean seriously. Not going to work. Fine! It will be fun! I agree 8v8 will be fun, but not with somehow looser MM and 5 person Platoons. This just means mixed tiers and more AI on solo teams. 8v8 with 3 person Platoons max would be a blast, assuming MM sees Platoons and evens teams out with said Platoons, however...Looser MM. Lols, 3 more Rails/Plasma incoming. Its unfortunate I will be on holiday as its the Easter break so wont be able to join in, but definitely a step in the right direction. Just hope if they do have to fill in with AI then they allocate the AI to the teams with the larger platoons first.